(Nanowerk News) Enzymes are nature's tools for catalyzing life's essential reactions. Though unrivaled in their efficiency and selectivity, enzymes only carry out a narrow range of natural reactions, limiting their usefulness in modern organic synthesis. 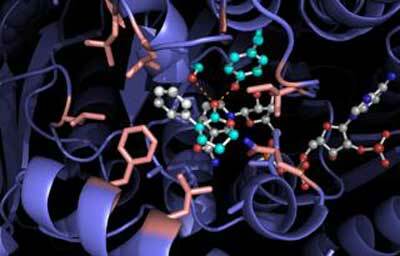 Now, Princeton researchers report a method that expands the realm of enzyme reactivity to a non-natural reaction and allows organic chemists to access the high selectivities offered by enzymes. Published in Nature ("Accessing non-natural reactivity by irradiating nicotinamide-dependent enzymes with light") and led by assistant professor of chemistry Todd Hyster, the work is the first example of a reaction that employs light to activate new reactivity in an existing enzyme. The research team targeted a family of enzymes called ketoreductases that traditionally transform ketones to alcohols. Ketoreductases are dependent on a co-factor, or molecule commonly present to help drive enzyme-catalyzed reactions forward, called nicotinamide, which is known to respond to light. Using a commercial kit from the company Codexis, the researchers irradiated a variety of proteins from the ketoreductase family to see if they could instead steer the chemical pathway towards a different reactivity. "These kits are a nice starting point for finding out whether your reactivity has a shot or not," Hyster said. "It really accelerated our discovery process," Hyster said. Their investigations revealed that photo-excited nicotinamide-dependent ketoreductases successfully catalyzed a dehalogenation reaction, in which a halogen atom is replaced with a hydrogen atom, to produce a variety of chiral, or geometrically distinct, small molecules called lactones. Through subsequent, minor mutations of the enzyme, the researchers were able to reach high reaction efficiencies and selectivities. They proposed that the good reactivity arises from a charge transfer complex and the selectivity owes to the key intermediate binding within the active site of the enzyme. The reaction showed that enzymes can be coaxed to perform new chemistry and in the future Hyster's team hopes to apply their methodology to even more synthetically challenging reactions.